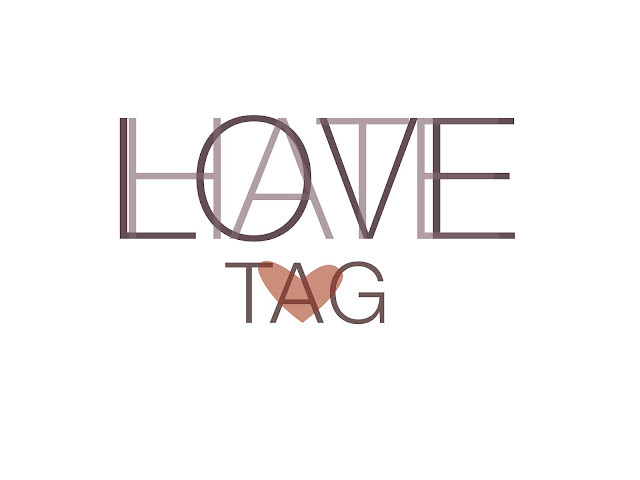 Tag Tuesday: The Love/Hate Tag! It feels like it's been a while since I last wrote a tag post but yesterday I was kindly nominated to do the Love/Hate tag by the lovely Sinéad over on Dreaming Again and of course I couldn't say no! The rules are simple - List ten things you love and ten things you hate (dislike) then tag 10 bloggers to do the tag next. My cat - I absolutely love my cat and I don't care how much of a crazy cat lady that makes me sound! She makes me laugh when I'm feeling down and I don't know how I'd cope without my little bed buddy! Summer weather - I'm really loving the good weather right now and it's amazing how a bit of sun can instantly cheer up my mood! My family and friends - It's not been a secret that lately hasn't been the best time in the world for me but the thing that's surprised me the most is how amazing my friends and family have been. As soon as I told them what was going on, they were all right there for me, planning nights out and shopping trips and I cannot thank them enough for that! Chiquitos - I love food in general but I would try and be more specific and say anything from my favourite restaurant. Everything in there is amazing and I could happily eat there every day of the week! Wine - To me there's nothing better than sitting down after a stressful day at work and sipping on a lovely cool glass of rosé wine. I'm not an alcoholic I swear! Long drives - The best thing to do when I'm feeling a little stressed is to just get in my car and drive. I love the silence of driving and I find that that's the only time I can really think. Mango! - As weird as this sounds, I've become a little addicted to Mango! It all started with Starbucks mango juice which is sort of like a slush puppy if you've never tried it. I then moved onto fizzy mango drink from Tesco and I've also put an order in for mango scented shampoo, conditioner and even lip balm. I am addicted to it! Online Shopping - I feel for the past month that I have done nothing but online shop and I think I'm becoming a little addicted. There is nothing better though than coming home and seeing a lovely parcel waiting for you by your front door! But seriously, take it away from me! Music - Everybody loves music and no matter what mood you're in, there's always a song for it. I don't know what I'd have done the last few weeks without my iPod! Blogging - Last but definitely not least, is blogging. It's been just over two years since I started and I still absolutely love it. Self-Obsessed people - Part of a conversation is a bit of give and take, it's two sided. I hate people who dominate conversations and only talk about themselves. It's just down right rude and let's be honest - there's only so much I can hear about your kids before I all together stop caring! Liars/Fake people - Honestly what is the point in lying to people? You all get found out eventually so I'd much prefer it if you're honest with me from the get go! Traffic - I really hate being stuck in traffic! Especially if you have to be somewhere. Who drives at 20mph?! Bad drivers - Sticking to the driving theme, my other pet peeve is really bad drivers! Like how do some people pass their tests?! Calls from unknown numbers/Cold calling - This one is actually from Sinéad but I can totally agree with it! A few weeks ago I was applying for jobs and everytime my phone rang I thought it was about the job but no, it was an cold caller! Don't get my hopes up! Radio adverts - We listen to the radio a lot at work and OMG how annoying are the advert breaks?! They are super cheesy and if anyything they put me off buying from them! Users on eBay - Although I absolutely love my precious eBay, recently I've had a run in with a few idiots on the site! I've been trying to sell my iPhone as collection only and technically I've sold it twice but the first buyer was from Spain who then deleted their account and the second buyer wanted it delivered. It was collection only!! Urgh! Blogger Bullying - We all have to start somewhere and I think laughing at other user's because they're "not as good as you" is quite shallow. We need to encourage new bloggers and grow our community, not make people feel like they're not good enough. Spiders - I absolutely hate spiders. It's not exactly an uncommon hate so I'm sure most of you can understand why! Looking for a new job - As I said above I've been applying for new jobs and I have to admit, I absolutely hate it! The whole process is frustrating and I wish it was all a lot easier! Like am I qualified enough to apply? And then if you are, there's a huge application form to fill out. AINT NO BODY GOT TIME FOR THAT! thanks for nominating me! I love my kitty too and tell me about it, blogger bullying needs to stop! I'm addicted to online shopping too! It's so much easier to buy things with the click of a mouse, rather than having to queue up in stores. Thanks for the tag :) The one about blogger bullying kind of threw me! I've never come across any before and if people actually do that, thats terrible!! Also, I am so with you on the finding a new job one! I hate it. Thats probably my main reason for staying where I'm at because I dont want the stress of looking for a new job!! Fab tag! Applying for jobs is such a pain! I applied for more than 10 part time jobs and eventually got 1 after about a month and a half. I'm happy I have it now but all of the other applications haven't even been answered yet - that is so rude!